So I was out shopping with my wife for back to school stuff for my daughter. Well, I quickly became bored with it so I set course for the toy department. I made it to the ninja turtles and was about to buy myself a Raphael from the Nickelodeon cartoon when I saw this big Donatello. 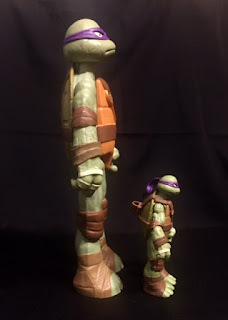 I've been buying big Donatellos lately, which you'll be seeing more of later, so I put Raphael back and chose Donny. 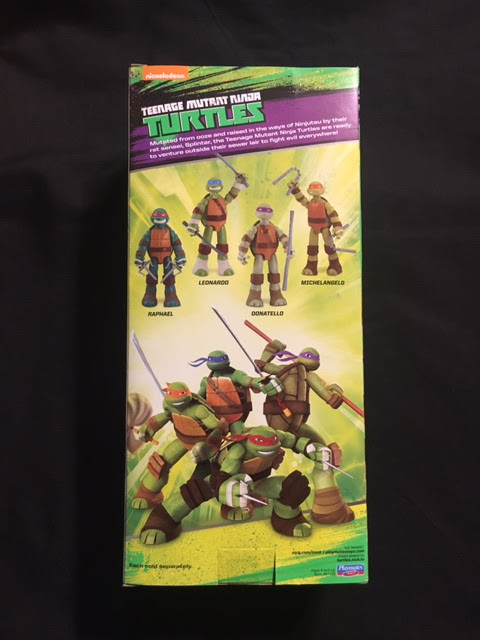 Now Raphael was around nine dollars and Donatello was twelve dollars and since Donny was way bigger that should have been a red flag. Donatello looked to be a great value as he was over twice the size of the regular action figures. So I got him home and released him from his cardboard prison. The instant I touched him I knew he was a bad choice. 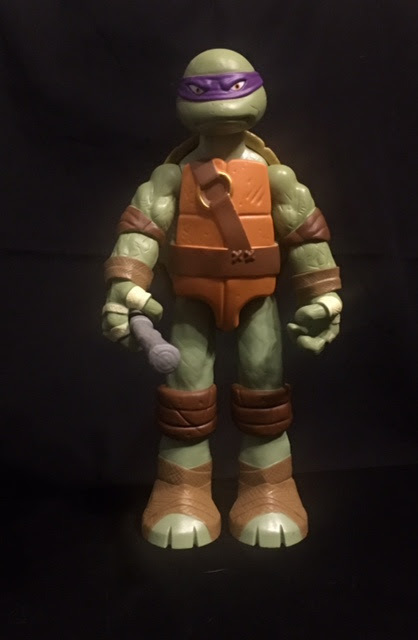 The plastic used for Donatello is very cheap feeling. He feels like one of those cheap Chinese knockoff action figures, he is hollow and if you tap on him you get an echo from his empty body. When you take a good look at him and you quickly see that he's too flat. Also, all the wraps and belt are molded to the body which makes it look very cheap. It's so bad that the section of his belt between the back of the shell and the front isn't brown but green because it would have been too much work and too much money. 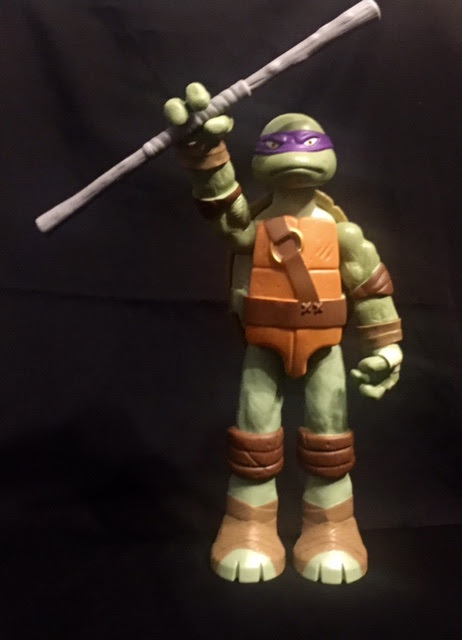 The only accessories that Donatello comes with is his staff which is painted gray which made no sense to me. His body has brown paint on it so why couldn't they paint it that color. I could take all these negatives if it wasn't for his articulation. Donatello has a total of seven points of articulation which is just sad. His head has a ball joint and can move pretty well. His legs have one joint where the top of his legs meet with his body which allows him to move his legs up so he can sit or kick. The arms have all the rest of the articulation points including his arm can move up and down where the top of the arm meets his torso. His wrist can also spin 360% which helps with his staff-wielding. Donatello can move his arms up until it hits the shell and can move down until it's pointing down to the ground. Just lame. 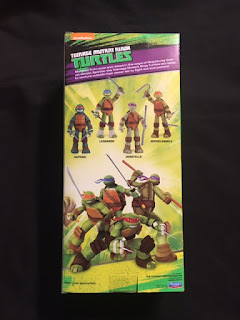 As of right now, you can buy the four turtles in this scale and that's it. This is a problem not just with TMNT toys but most sets in general. How can your Mutant XL turtle fight other bad guys when all you can get is the bad guys from the regularly sized line. But it's also a problem with the regular sized guys. I looked at every TMNT toy they had on the shelves and there were only turtles. No Shredder or foot soldiers, no April Casey or Splinter, just turtles. This is a problem with this line currently and it should be addressed but I'm not running Playmates Toys so whatever. 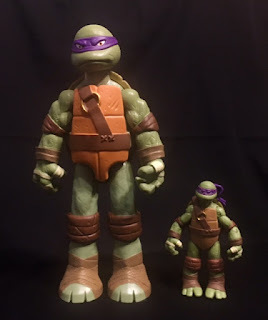 Overall I was not impressed with this Mutant XL Donatello. Which the cheap plastic and bad paint job and the terrible articulation I can only give this toy a 3 out of 10. Maybe next time Playmates.